Don’t let the exterior strip mall feel of Townshend’s fool you. Once you’re inside you are transported to a cozy universe. 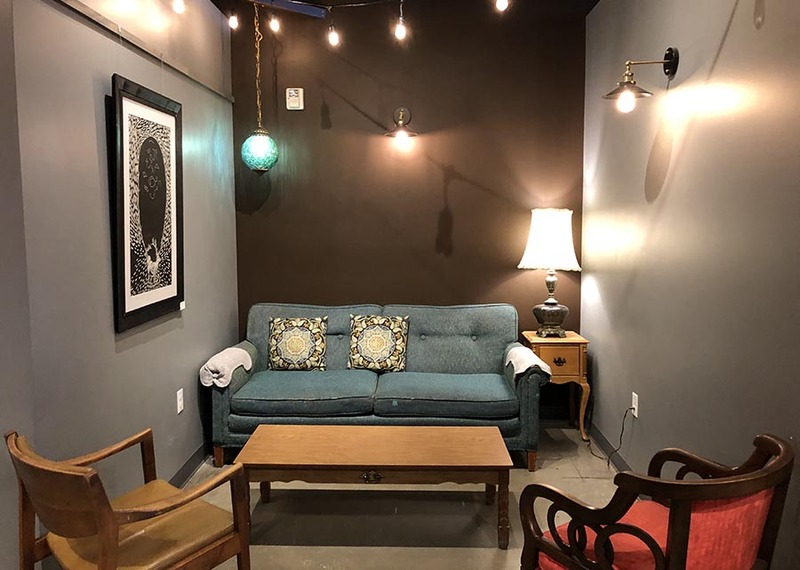 Different nooks and crannies are made unique with vintage furnishings and a rotation of local art on display. 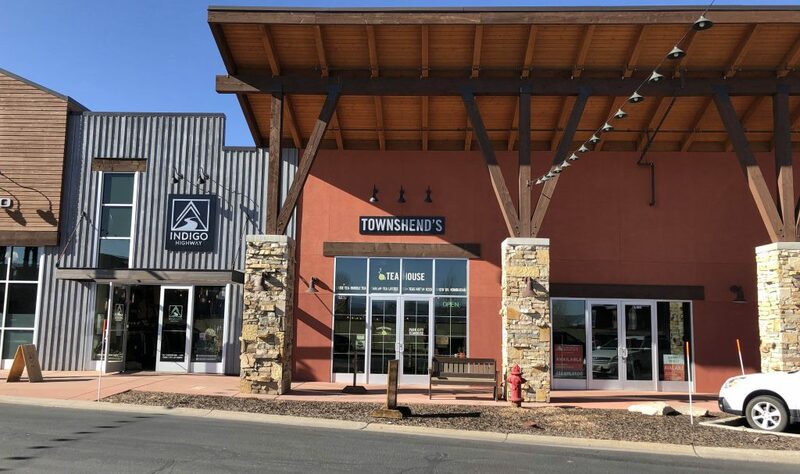 Townshend’s is a great community player, as exhibited by their donation of 10% of profits to local nonprofit Recycle Utah during the recent Live PC Give PC event. It’s no surprise this has become a hot spot hangout for early risers, high schoolers and everyone in between. While this is not Park City’s first teahouse, I think Townshend’s is here to stay. 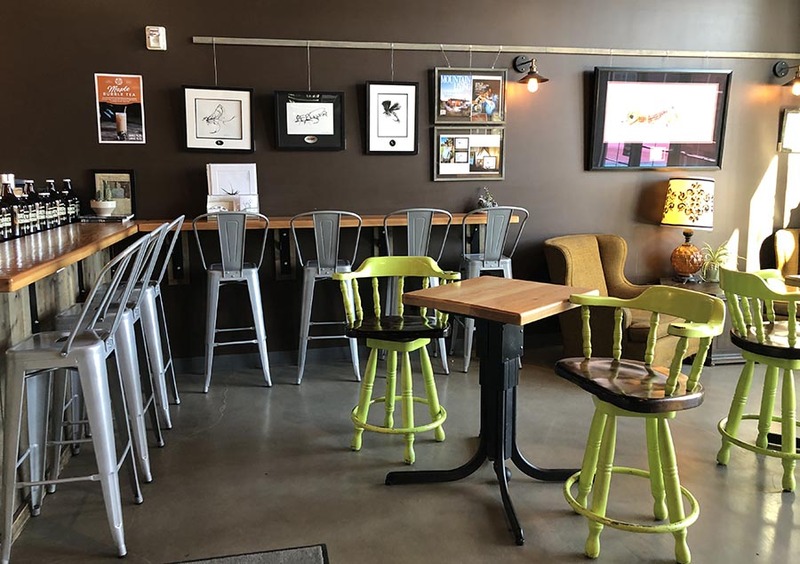 In fact, its bustling Kimball Junction location is the perfect place to stop, sip and reconnect. Townshend’s began as a college project at the University of Oregon in 2002. They now have locations in 4 states. The Park City teahouse was started after long time resident Polly Rihm approached the company about opening a location here. If you’re not a serious tea lover, never fear. Townshend’s will teach you the way. And if you’re a tea snob, you’ll appreciate the care that is taken in the selection and brewing of each cup. Each tea is steeped for the exact right amount of time, so don’t expect this to be as quick as a “cuppa Joe”. If you’re not sure what you want, you have a couple of options. The menu is very descriptive about the tastes and benefits of each tea, so do take the time to look. The Tea Tender is also a good resource for your selection. But our favorite option is heading over to the tea wall to give each tea the sniff test to see what appeals to you. The cup of tea is a worldly experience with origins in China, Japan, India, Africa, Argentina and more. So it’s only fitting that Townshend’s serves up every style of tea in a town that attracts visitors from the world over. From bubble tea and loose leaf to kombucha and medicinal blends, there really is something for everyone. Bubble Tea originated in Taiwan and follows a recipe of tea, milk and tapioca (the “bubbles”). Black Tea is more caffeinated than most other teas and is grown in mountainous regions of China, India, Sri Lanka and Africa. Green Tea has many medicinal benefits and is grown in China and Japan. White Tea is delicate in flavor which matches how it is produced, typically in China. Oolong Tea is a semi-oxidized Chinese tea produced by withering the plant under strong sun and the best varieties can sell for thousands per pound. Chai Tea as we know it originated in India, Chai is also the Russian and Hindi word for tea. Yerba Mate teas come from South America and are known for producing a good caffeine buzz. Rooibos is indigenous to the Western Cap Mountains in South Africa, and is a good caffeine-free sub for black tea. Herbal Teas are made from fruits, blossoms and other herbs, and are never caffeinated, making them a good option for all ages. 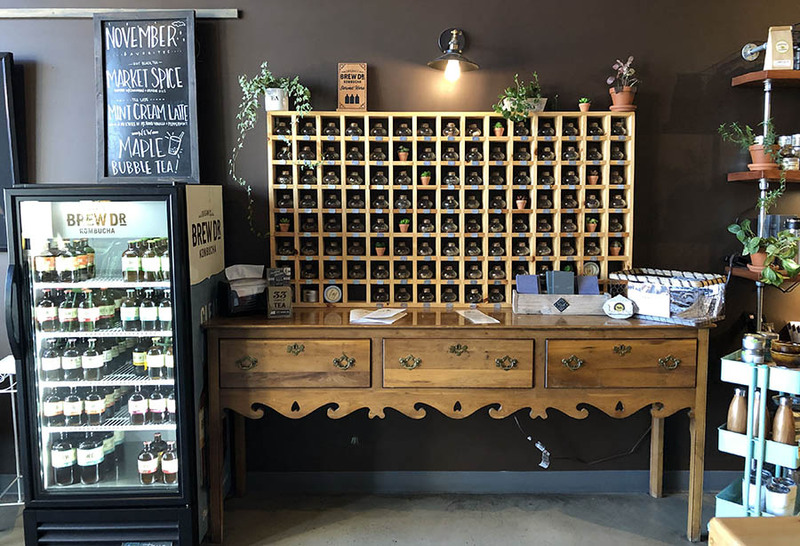 Townshend’s offers a full line of medicinal blends in its Apothecary section. Selections fall into three categories: relief, mood and body tonics. Ask your Tea Tender for the best blend for what ales you. 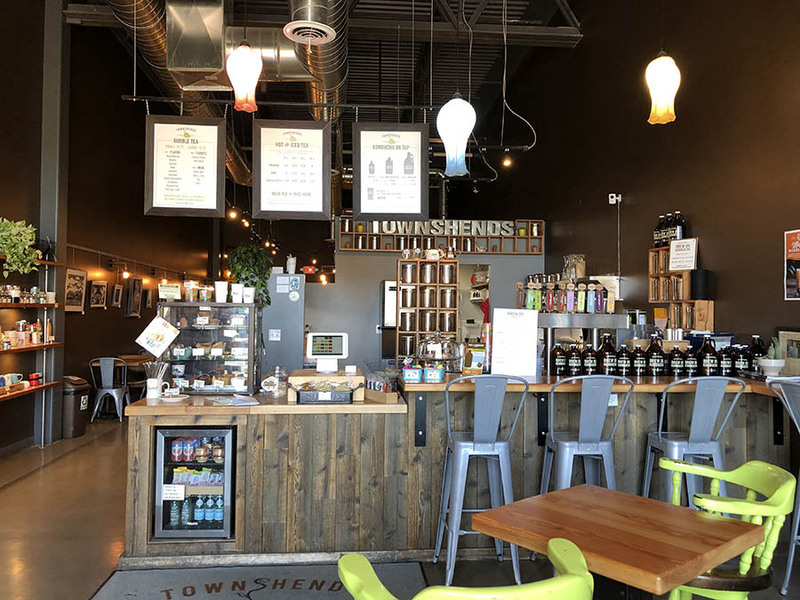 Townshend’s brews ten of its own kombucha flavors out of the basement of the Portland location. Selections of this organic blend is available on tap or in bottles. All of the baked goods offered at Townshend’s are made by local providers and their protein balls are made in-house. They even offer some gluten-free options and serve up locally owned Jafflz for those looking for something with more substance. My 18-year old son loves Townshend’s Tea. When he is in town from college, this couch is where he meets up with friends. I also enjoy visits to Townshend’s Tea with him. We sit on this same couch and he brings me up to speed on his college life. We always seem to run into friends every time we visit. 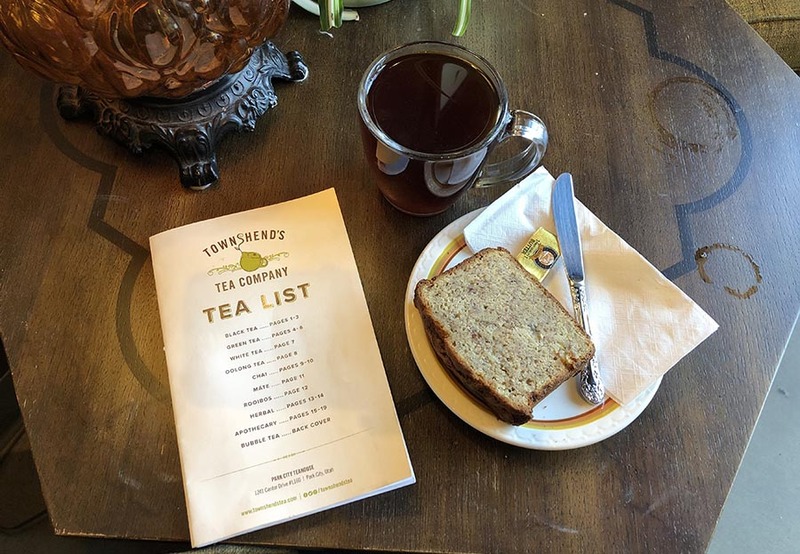 Townshend’s Tea is truly a great addition to Park City and I highly recommend you check it out. We love Townshend’s Tea In Park City . As mentioned the atmosphere is very relaxing and a great place to meet up with friends ,coworkers, and family. The tea lattes are our favorite drink , however we love to come in and order loose leaf teas to take home to steep a pot of tea for those times that we cannot make it to the teahouse but still want a cup of their high quality tea. The teahouse has an all around comfortable feel , if you have not been there you should definitely go you will be glad you did. Nancy, thank you so much for your amazing article! We are so honored to be feature on your site.